Strawberry Cookies are my favorite Strawberry Cake Mix Cookies! These White Chocolate Strawberry Cake Mix Cookies are so fun and delicious, and so super easy! Fun, festive, and SUPER SIMPLE! 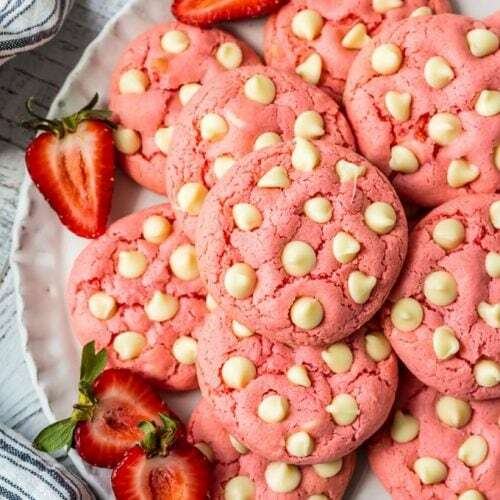 Strawberry Cookies with White Chocolate Chips are the perfect Pink Cookies for Valentine's Day, Easter, baby and wedding showers, and beyond! This Cake Mix Cookies Recipe will blow your mind. In a large bowl, combine cake mix and baking powder. In a separate smaller bowl, whisk together eggs, oil, and vanilla by hand. Whisk until well combined. Pour egg mixture into bowl with cake mix and stir with a spoon until a dough forms. Be sure to fully combine. Mix in the white chocolate chips. Using a small ice cream scoop, drop rounded balls of the dough onto your baking sheet. These cookies flatten out quite a bit, so make sure the balls are taller than they are wide, and give them quite a bit of space between each cookie.